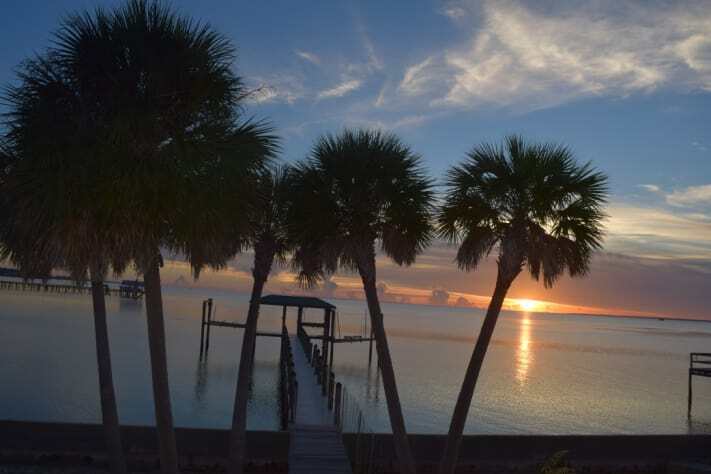 The name Sunset Retreat is perfect for this house- you will see why when you see the spectacular sunsets right from this bay front house. 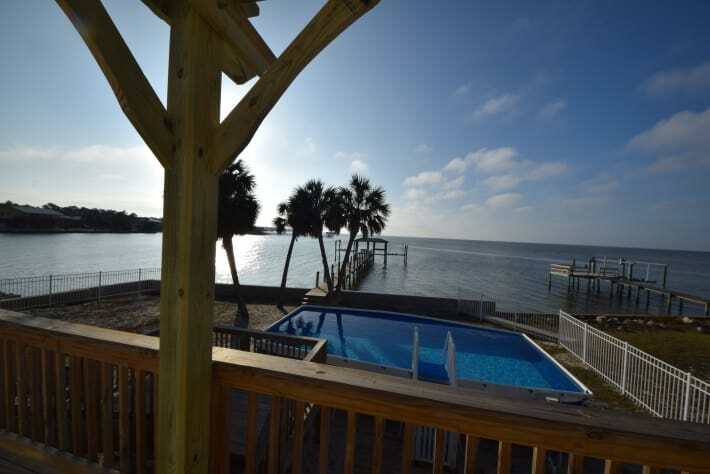 The beautiful wide open water views are endless! 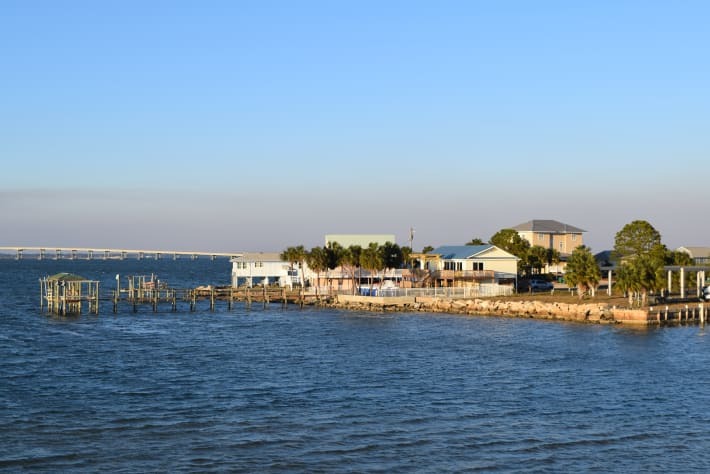 Your family and friends will enjoy this spacious waterfront front home with many amenities, including hot tub, boat dock, hot/cold private outdoor shower and bicycles to tour the island! Of course you can take a plunge in the 12x27' private swimming poo too! In additon to cable TV and a stero system, there is Wi-Fi throughout the house and a telephone with free local and long distance calls. 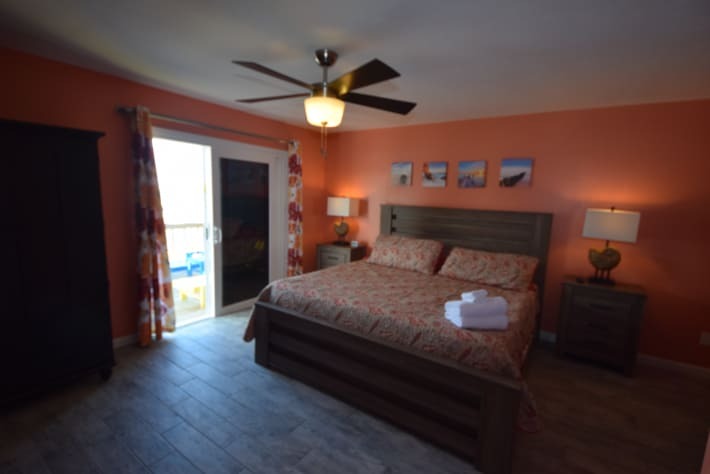 Sunset Retreat is a roomy 2 bedroom, 2 bathroom home. The living space has an open floor plan which is great for entertaining and the wall of windows lets in the stunning view and plenty of light. There is a large dining table as well a snack bar to enjoy your meals. 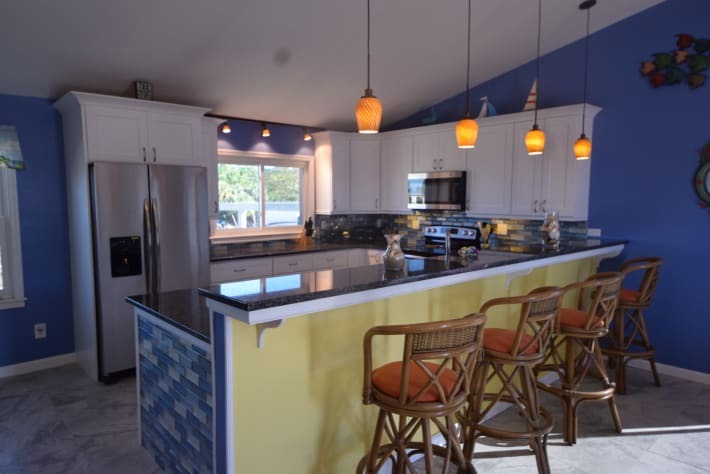 Sunset Retreat has plenty of space in the living room for the entire family to watch cable on the large HD TV or stream a movie on the blu-ray DVD. Listen to your favorite music or local Oyster radio on the stereo which has IPOD docking, radio and CD player. 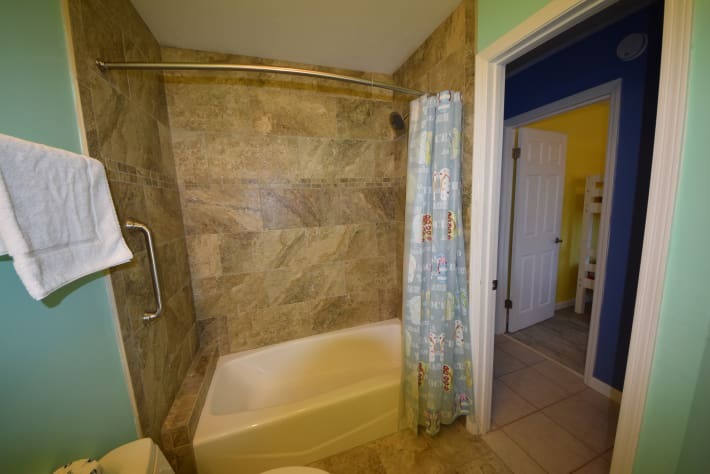 The master bedroom has a king bed and attached renovated bathroom with a walk in shower. Walk through the sliding door to savor your morning coffee on the expansive deck. 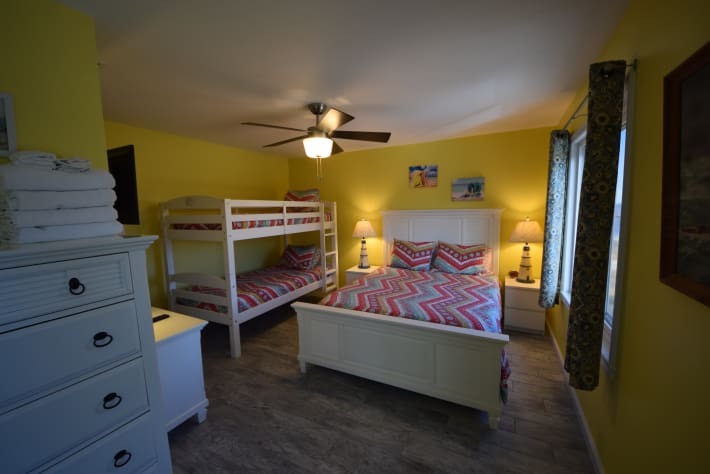 The second bedroom has a queen bed and a twin/twin bunk bed. 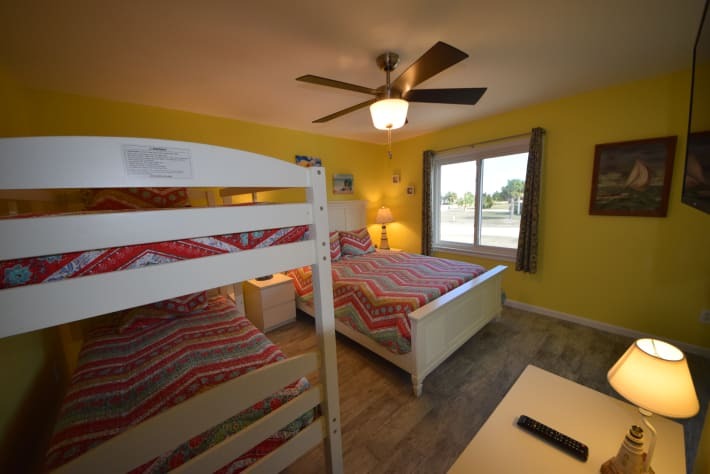 Both bedrooms are spacious and bright with plenty of windows and feature HD cable TV. 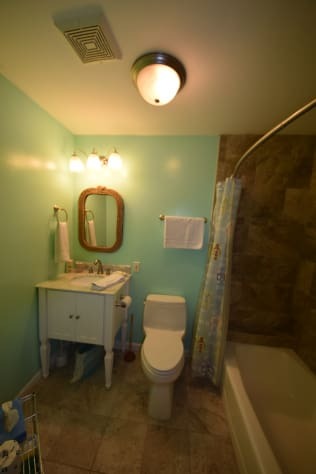 The second bathroom has a tub/shower combo and has been renovated. There is a pack and play for our small guests and a dog crate for the furry ones! The kitchen, with full size appliances, is very large and well equipped. In addition to plenty of pots, pans, cooking utensils, dinnerware, serving platters, glassware, etc., we also supply a slow cooker, waffle iron, baking pans, electric griddle and popcorn maker!! 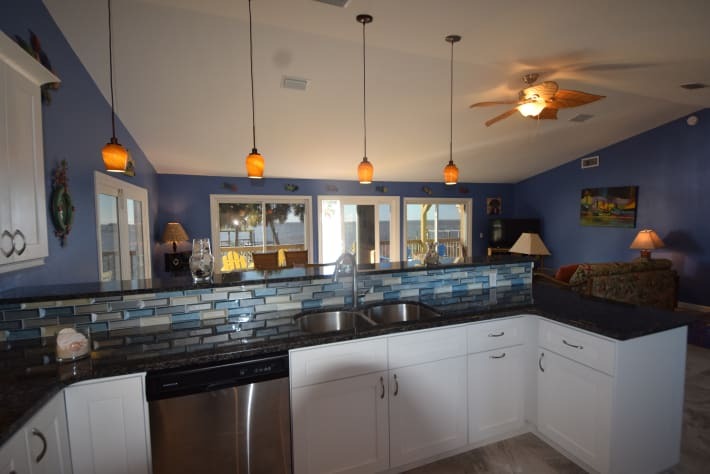 There is plenty of cabinets and counter space for you to use. 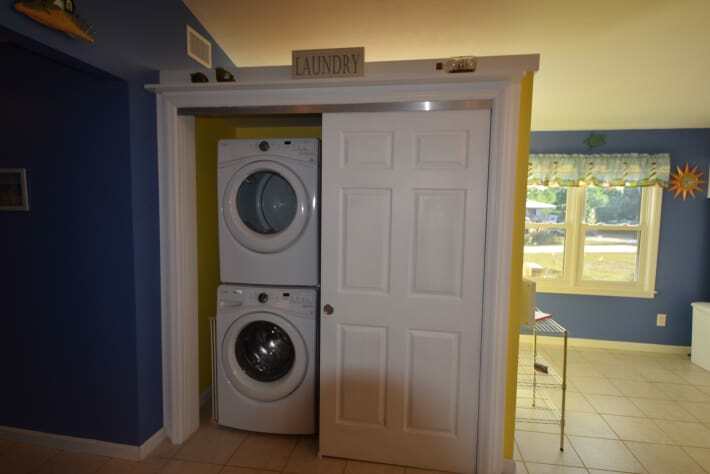 The full size washing machine and dryer are located on the living level- no need to climb stairs to do laundry!! 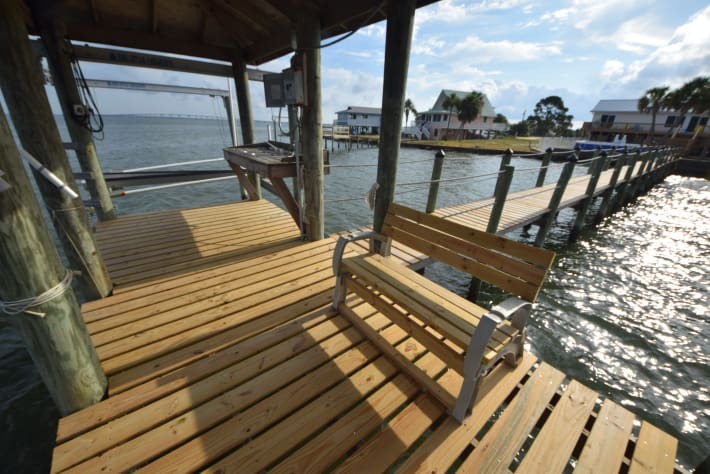 There is plenty of room and seating on the new oversized decks for dining al fresco or lounging on a chaise or rocker while taking in the view. Head down the stairs to the oversized yard which is partially fenced. Watch the pelicans and dolphins without leaving the house! 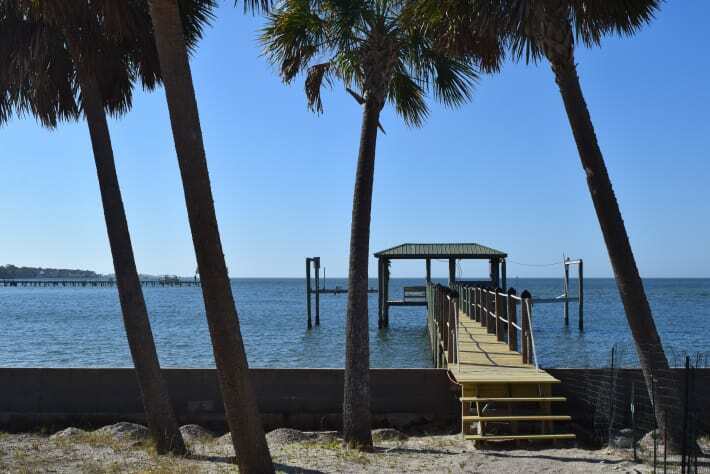 You can tie-up your boat at the private dock or kayak right from the back yard! The dock has water, a fish cleaning sink and electricity as well as a bench for fishing from the dock or just relaxing on the water!! 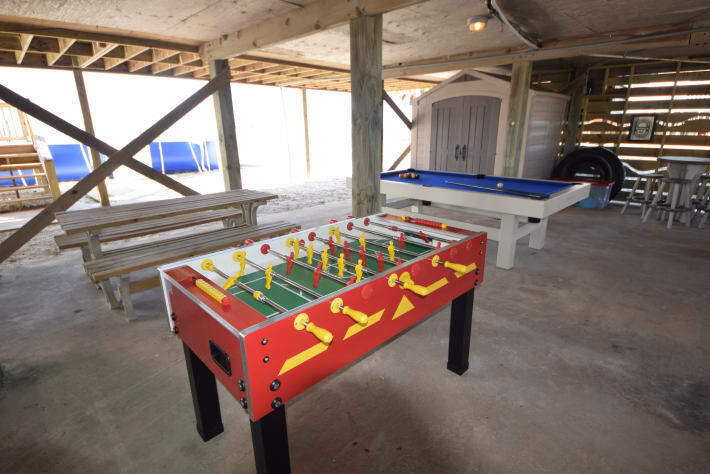 Under the house is a game room with a full size pool table and a foosball table and a picnic table to enjoy meals next to the pool. 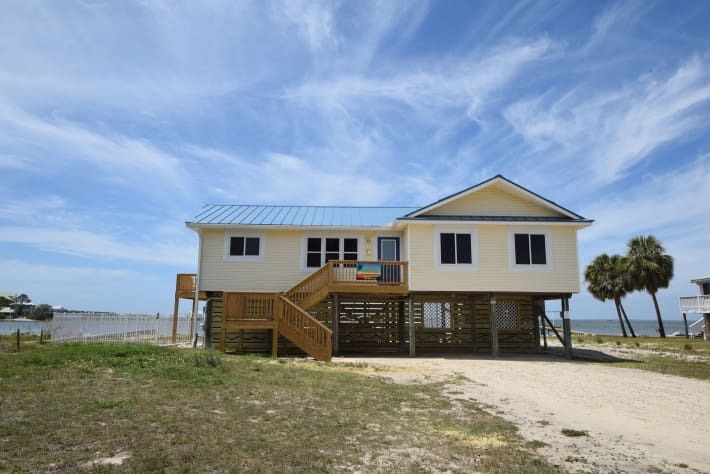 Sunset Retreat is located in a quiet area, only minutes to restaurants, shopping and the St. George Island light house. Beach access is a few blocks away. We provide a cooler chest, bikes, beach chairs, beach umbrellas and beach towels so you don't need to pack them! When you're done with the day's activities, enjoy a soak in the hot tub or a swim in the p[ool before preparing the day's catch on the park-style charcoal grill. A four seat and a 6 seat golf cart are available at discounted rates to our guests on a first come first serve basis. Please ask for more information. 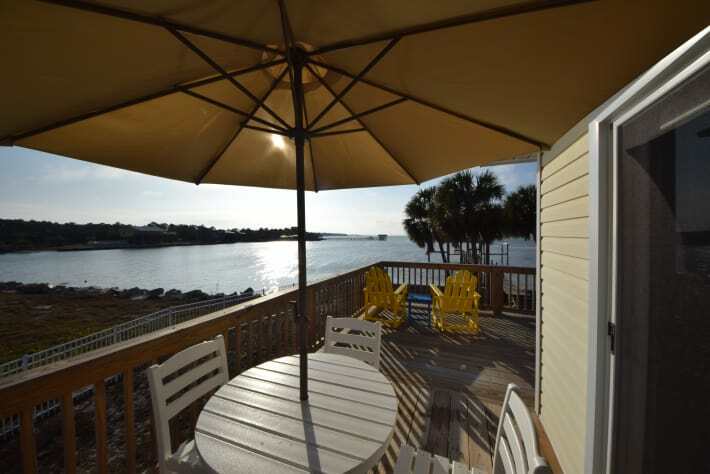 You will appreciate all the amenities in addition to the amazing views and sunsets. 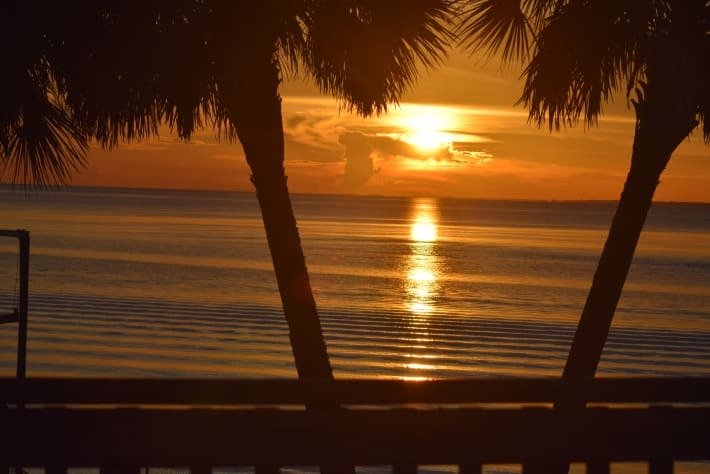 Sunset Retreat will provide the exquisite vacation you want every year! If all that isn't good enough, our guests also enjoy discounts from local gear rental stores! This was our 3rd stay at Sunset Retreat and we are already booked at another Roenicke property for 2020. You can count on a well-stocked, meticulously maintained home when renting from Tom and Lucinda. 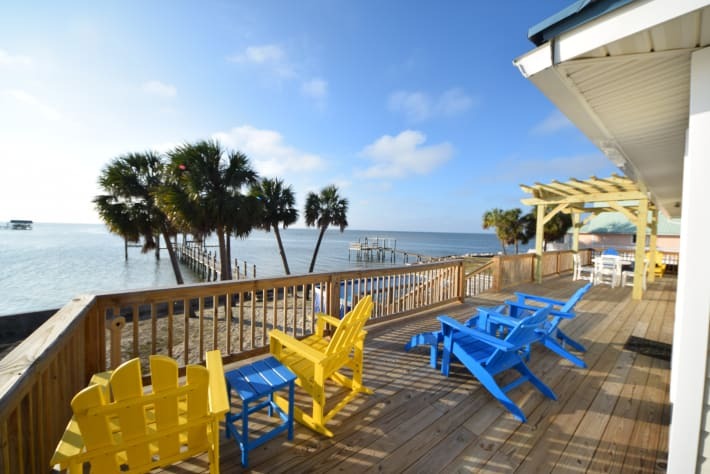 SGI has become our go-to location for a spring getaway. Beautiful beaches, no traffic, fishing, biking, kayaking - it has it all! My Husband and I and our adult children stayed for over a week. Beautiful. We saw dolphin nearly every morning. Enjoyed the hot tub and pool. There are very nice beaches near the home. It was really convenient not to bring beach chairs and beach umbrellas with us from Illinois. This home is well stocked in the kitchen area. The surrounding area is super quiet and laid back. We brought our German Shepherd with us, the fenced in back yard was perfect for him. Had a great time! We would definitely stay here again. We had a great week at Sunset Retreat. It was perfect for our family of four. Our week at Sunset Retreat was amazing. The views were incredible. The fishing off the dock was good. Watched the dolphins swim right by everyday. Enjoyed the hot tub, pool table, and swimming pool. Sunset Retreat has it all. Anything needed in the kitchen was all there. 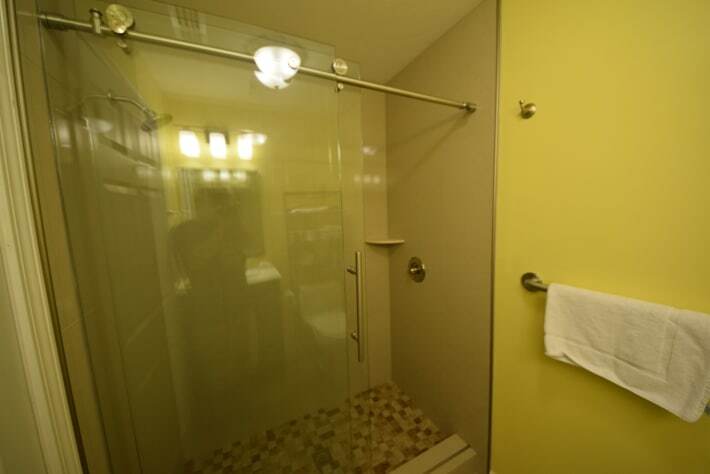 The linens were higher quality than most rental properties, and even provided extras. Beds were comfortable. Can't say anything negative about it. Sunset Retreat has it all. You won't be disappointed. We loved this house! It is the perfect size and has every amenity we could ask for. The pool, hot tub and game room were huge bonuses for our kids. The outdoor furniture was top notch, I probably could have slept out there in the rocking chair. Even small things such as good quality oyster knives were stocked in the house. Tom was also very helpful in getting the golf cart to me at the residence. 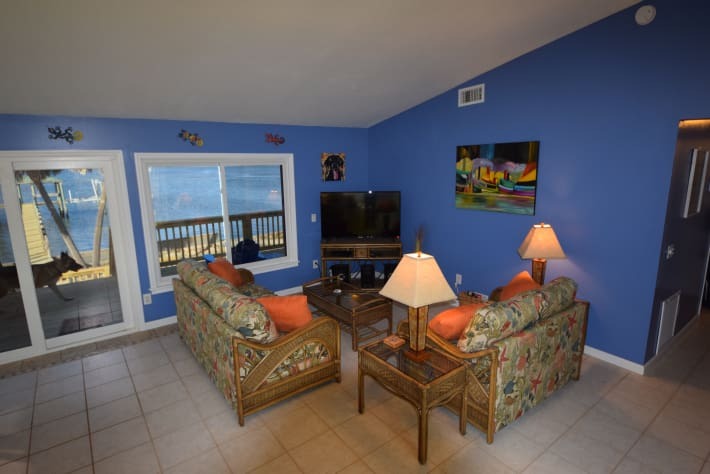 I will always look first at their properties when booking trips to SGI. If I could add one thing, and this is by no means any negative reflection on this property, I would ask Tom and Luncinda (or anyone building/renovating a rental) to consider making one of their properties either partially or fully handicap accessible. It's incredibly difficult to find anything in the price range of their homes that accommodates a wheelchair. But again, that's a personal issue and luckily we can manage some steps with our family member that has a wheelchair. Thank you so much! This was our second stay at Sunset Retreat and we’re already booked for 2019. Once again, we found everything we needed and more. We had an issue early in our visit and Tom immediately answered our email and made every thing right. We highly recommend any of Tom and Lucinda’s properties, because they have high standards and you know they’ll respond if you need them. 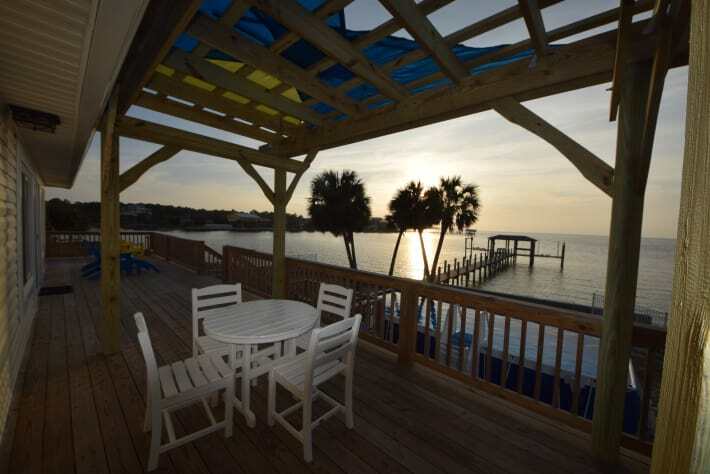 This property has a unbelievable view of the bay! We had an awesome time eating and just sitting on the large deck with it's great furniture and enjoying the water and sunsets. The large windows on the front of the house provide a perfect view even if it is raining or cold. 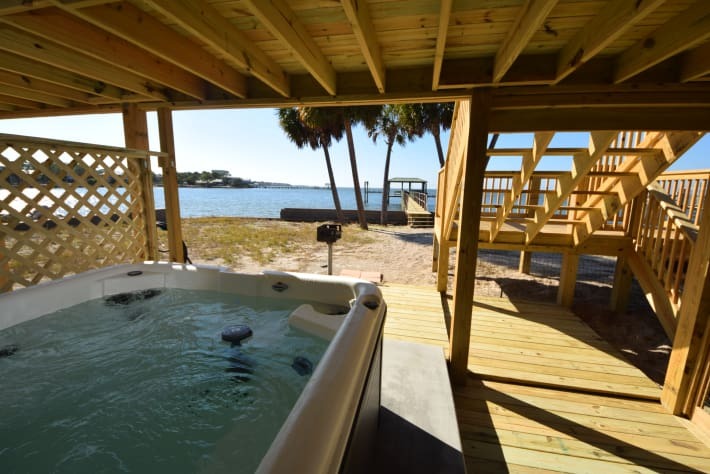 We also enjoyed the hot tub at night and fishing off the dock during the day. Also, it has very comfortable beds which is unusual for a rental. All I can say is it’s the best time we have had in years! The place is so nice an has everything you need ! Everything was very clean ! The beds slept great ! I give this place a 10 . We can’t wait to go back !!!! This property was perfect for our family. 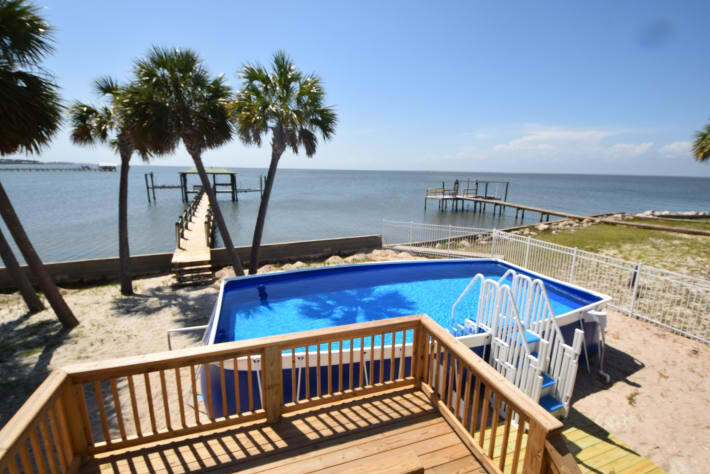 We've stayed in SGI before but Gulf front so I was a little hesitant about this property since it's bay front. It totally surpassed my expectations! The sunsets over the bay are priceless. My husband couldn't get enough fishing off the bay...making several trips to the bait store daily lol. The house had everything we needed and included beach chairs & toys as well as bikes. My daughter had a great time in the pool and hot tub after long days on the beach. The house is very clean and well maintained. The beds were sooooo comfy...not your typical rental! The owners were wonderful to work with. We would definitely stay there again. Sunsets are absolutely beautiful! The house was perfect and had everything we needed. We had the pleasure of meeting the owner, Tom. He was nice enough to show us one of his other rentals. We will definitely be renting from them again and would recommend them to anyone! Wonderful stay! Beautiful property, perfect setting...our family of 4 rate this as one of our most memorable vacations. We have two sons who attend college in Tallahassee and the house was the perfect set up with the pool, dock for fishing, pool table and foosball table. They were content and it allowed us all to reconnect. 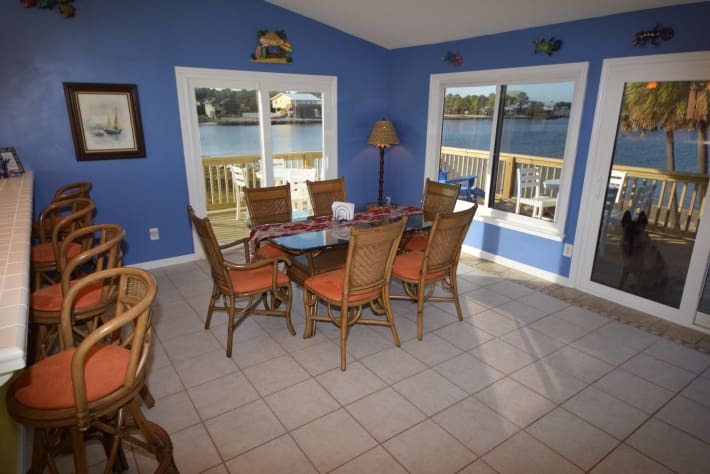 We ate most of our meals in the large kitchen, taking in the beautiful water views and played board games at night. Perfect trip. Thank you for sharing your lovely home.